Desi actually liked the outfit too! I really spent about 20 minutes choosing something then another 20 on his hair. All of this just to go to a birthday party. hehe. Yes well that was our weekend. We did have a good time at the party. It was nice to see family. I didn't take any pictures though. I wish I would have, the kids were playing so cute! Something a little off topic. Desi has Handball on mondays. Today when went to pick him up I found out just how German he is! Today the National German Handball team is playing and all the kids got German flag stamps on there cheeks. Very fitting as Desi and I just got our visas extended for two years today! That is exactly what i need to get through this week. ok well the next few weeks. I don't really have too much say. I really wanted to post on Sunday when i had some time to write something nice, but i was at my sister-in-laws house (that Baileys cake was amazing) visiting. We got to see their new apartment. It is one floor down from the one they live in now, but it is amazing. I love how big it is and the layout. I don't like the tile in hall, but i don't like tile anywhere except the bathroom anyway. The kitchen is a bit small, but i don't think she is that much into cooking. In return they have a huge living room combinded sort of dining room. in other words there is a large archway connecting the rooms. They also have some nicely placed storage space. all in all i like the apartment. I ended up getting sick. I would just like to say that when i get sick, i get really sick. I still don't feel well, but i managed to go to school today so i guess i am not that bad off. I hate going to doctors or staying home because i am sick. i always feel like i am not sick enough to need to. I felt this way yesterday and found out had i not gone yesterday i would be in bed with over 100° fever. Glad i went. diet is going great! i really recomment myfitnesspal.com it makes it easier to stay on track. I have already lost 4-4.5 lbs in two weeks. i am very amazed and motivated. 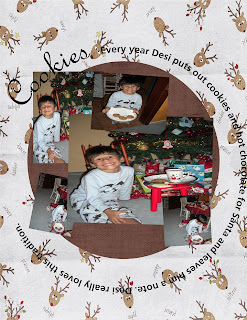 I have been scrapping like crazy (when i have time) I finally finished the Christmas eve pictures and post so if you want have a look, just click on the christmas eve tag. I am trying to keep up here and so far so good. i forgot the 4th one. oh well. i am working hard for school and i can't wait for it to be over. i guess that really sums everything up. i will try for a better post next week. Now i have to start on the the christmas day pictures. This is one of my brothers. The younger one. We are really close even with an age difference of like 7 years. He is so smart and sweet. I know that one day he will go on to do wonderful things. I love you Brian!! Today is my first wedding anniversary. I have been together with my husband for 4 years but we only got married just last year. It was small and not the wedding i want to have one day, but i really felt it was more important that we were married and the wedding will come when we can afford it. I really have to say that it was one the happiest moments of my life. I love you more anything in the world. I want to spend the rest of my life with you. We fight sometimes, but i know the alternative. We both know where you end up without communication. I know we have kinks to work out, but i wouldn't trade my life for anything else in the world. I want to post my resolutions here because i think i may keep some of them this year! i really think i will do it all this year. This new years eve was similar to christmas eve. bad moods all around. most of it is due to the passing of Maik's grandmother today. She was 93. Nevertheless we celebrated the passing of a new year. Welcome 2009 we all hope you hold more for us than 2008 did! Today we ventured dow to the Waterfront which turned out to be a new mall (the only one) in our city. For a winter promotion they had and ice sculpture display set up and an ice skating rink. After enjoying the mall we froze ourselves and enjoyed a once in a lifetime expierence with ice. Our Chistmas morning rocked! It was wonderful to just be the three of us. We were a little pressed for time because of a family dinner later that evening. I really just have to say that there is nothing like seeing Christmas throught hte eyes of a four year old child. Christmas eve is usually filled with german traditions for us. We walk to our church to watch the christmas story preformed by the children at our church. While we are gone Maik's mother decorates the tree and the "Weinachtsmann" or german santa comes to visit. We come home and have christmas cake and coffe. After that we open presents and put together toys (lol). We then have a traditional german christmas eve dinner: Brockwurst (sausages) and potato salad. Those are a normal traditions. That is not what happened this year. Christmas eve this year was not fun. THIS YEAR was different. We tried hard to make it fun and wonderful at our house, but Maik's parents fight was a major downer. Luckly Desi and Hannah did not notice. and desi with his present from us. Here is Desi opening the last box on his advent calendar. Desi opening his gift from mama and Papa.The expression is so funny. He really loved it though. The top pictures are of Desi in front of our tree and with his present from Oma Pille. The bottom pictures are of Maik opening his present from Desi and me. Hannah opening her presents and being cute as usual! She got a Marble maze (marbles everywhere!) and a baby bag. These are some pictures of the family. If you look close you can see our living room. The top picture shows where we hang our stockings. On the window! Here is my new nephew Ben. It was his first Christmas this year. He got a few cool presents like a tiger that vibrates. Desi opening some more of his presents. These are his legos and his new favorite book. Desi opening more presents. He really got some things that he wanted. Just the look on his face shows how happy he was. Desi doing our tradition of leaving hot chocolate, cookies and a note for Santa. Desi really got into it this year. He is what Santa left. the empty cookie plate, filled stockings and the presents under the tree.